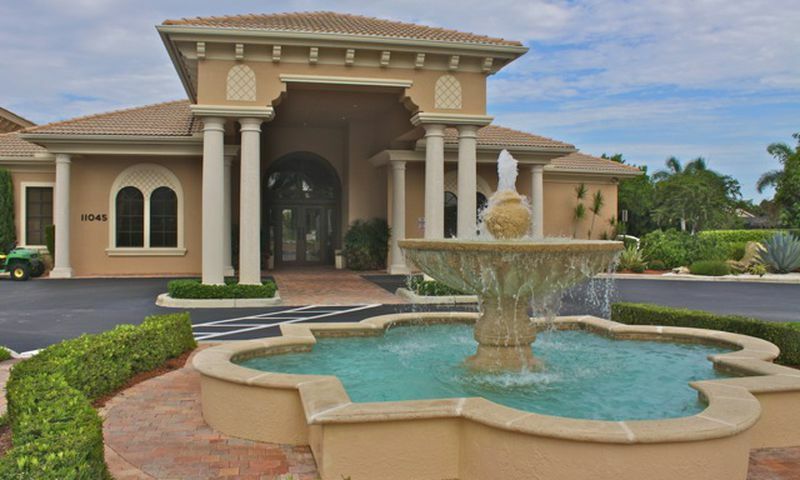 Tivoli Reserve is an active adult community located in Boynton Beach, Florida. With all homes above 2,200 square feet in size, this peaceful community appeals to the more discriminating buyer. The European-inspired homes in Tivoli Reserve are situated on large estate-sized home sites and feature beautiful manicured landscaping. Although Tivoli Reserve is a small community, the beautiful clubhouse offers a multitude of resort-style amenities and a wide range of leisure activities. This secure community has an easy, five-minute access to I-95 and the Florida Turnpike. Golf courses, parks, malls, restaurants, and movie theaters are just minutes away from Tivoli Reserve. At the lakeside Tivoli Reserve Club, residents can work out in style at the fitness center or take a class in the aerobics room. When rest and relaxation are desired, there are many choices. A social room, gathering hall, with a piano and bar, billiards, two card rooms, and media room are all part of the indoor amenities. There is also an arts and crafts rooms for hobbyists. A library allows residents to relax over a favorite book, while having computers nearby to take care of things as needed. Outdoors, residents can find friendly competition on four Har-Tru tennis courts. A refreshing swimming pool and spacious patio with covered terraces allows for spectacular enjoyment of the Florida sun. A beautiful gazebo and walking and biking trails as well as scenic lakes round out the outdoor amenities. Home Devco started construction of Tivoli Reserve in 2002. Two years later, all 220 single-family homes were completed. Residences in Tivoli Reserve range in size from 2,287 to 2,812 square feet and are available on a resale-only basis. Different floor plans are available that offer from two to four bedrooms, two-and-a-half to three bathrooms, and an attached two-car garage. Some residences have additional dens. Single-family homes at Tivoli Reserve offer lakefront, cul-de-sac, or private garden views. Many houses also have covered patios, screened lanais, and private pools. Tivoli Reserve offers its residents understated elegance in an intimate community. This 55+ community is perfect for active adults who enjoy the best that life has to offer. The quality and quantity of amenities are what one would expect to see in a community much larger. In addition, the Southeast Florida location with mild temperatures throughout the year makes Tivoli Reserve an outdoor lover’s paradise. A full-time activities director schedules many fun events and trips. Residents at Tivoli Reserve are also active in a variety of clubs catering to a multitude of interests. Homeowners can participate in a variety of activities, events, and clubs such as book club, bridge, aerobics, dances, card games, golf outings, glass fusion, and pool parties. Boynton Beach offers fishing and diving opportunities for water enthusiasts, especially at Boynton Inlet. Mangrove Nature Park and the Arthur R. Marshall Loxahatchee National Wildlife Refuge are some great destinations for nature lovers as well. In addition, all of Palm Beach County offers plenty of opportunities for outdoor activities. The Atlantic Ocean with miles of sandy beaches is just a 20-minute drive. Palm Beach County also offers plenty of cultural attractions. For example, performing arts enthusiast will enjoy the Palm Beach Shakespeare Festival in Jupiter, the Duncan Theatre in Lake Worth, or the Palm Beach Opera in West Palm Beach. Residents also have convenient access to the airport, which is only 20 miles away. Residents can also visit Miami, which is an hour‘s drive away. Tivoli Reserve is a great active adult community that has plenty to offer 55+ residents in Palm Beach County, Florida. There are plenty of activities available in Tivoli Reserve. Here is a sample of some of the clubs, activities and classes offered here. These single-family homes range between 2,287 to 2,812 square feet of living space. They have two to four bedrooms, two-and-a-half or three bathrooms, and an attached two-car garage. All homes are well designed with open floor plans and low-maintenance exteriors perfect for active adults. We moved in to Tivoli Reserve 6 weeks ago. From the very first day we were amazed at how friendly and welcoming the residents are. The common areas and homes are kept up beautifully. The office staff is professional and quick to respond to questions or work order requests. We are very happy to have chosen Tivoli Reserve as our new home. Anyone looking for homes should look at Tivoli, especially for larger square footage. We searched for a long time to find a good sized home to accommodate our kids and grandkids at the holidays and for entertaining. Our home here is finally exactly how we want it, since I spent a lot of time redecorating! We love the community, our home and the clubhouse has all the basics we use on a regular schedule like the gym and the pool. We have been very pleased with living here. 55places.com is not affiliated with the developer(s) or homeowners association of Tivoli Reserve. The information you submit is distributed to a 55places.com Partner Agent, who is a licensed real estate agent. The information regarding Tivoli Reserve has not been verified or approved by the developer or homeowners association. Please verify all information prior to purchasing. 55places.com is not responsible for any errors regarding the information displayed on this website.